Is uncertainty contributing to U.S. unemployment at present? Based on updated estimates of my work with Sam Choi the answer is “no”. Our measures of aggregate uncertainty and sectoral uncertainty are both back to pre-crisis levels and their contribution to unemployment has dwindled to zero. The chart below shows a baseline projection for unemployment (the portion shown in blue) and then adds on the contribution of other factors to get to the actual unemployment rate. 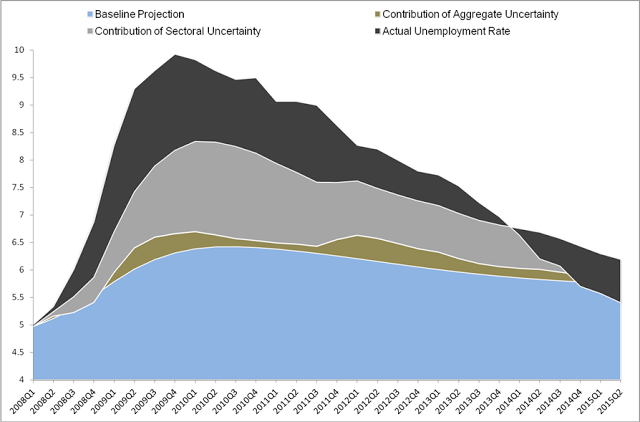 We find that aggregate uncertainty contributed a bit to unemployment in 2009 and again in 2012 (this is the portion of the chart shown in brown). Our aggregate uncertainty measure is the realized volatility of S&P 500 index returns, similar to Bloom (2009). The main reason for the decline in unemployment is the resumption of growth and unemployment’s own dynamics; their contribution is shown as part of the other factors in the chart above (the portion shown in black). Details are provided in our paper. Please note that as in other IMF working papers, the views expressed in this paper are those of the authors and should not be ascribed to the IMF.